Microsoft Knows Women Play Video Games Too, Right? This Christmas is the battle of the console gaming systems, as Xbox One and the PS4 duke it out for users. 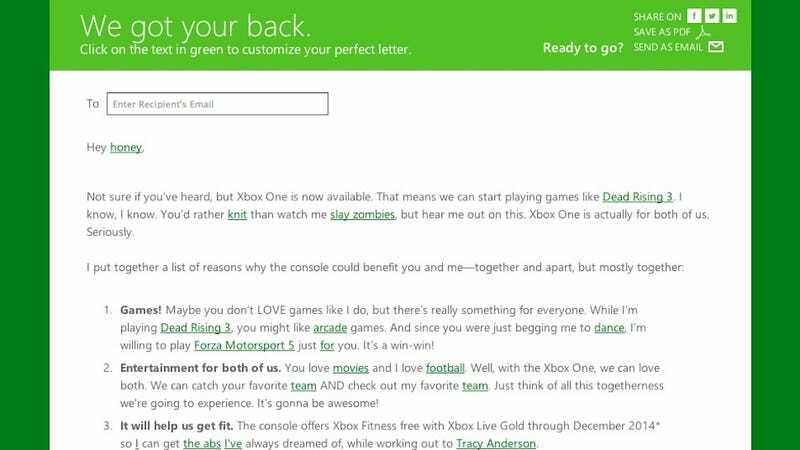 For its latest marketing effort, Microsoft decided to create a customizable form letter for those who'll have to convince mom, roommate or significant other before getting one of these $500 toys. Not sure if you've heard, but Xbox One is now available. That means we can start playing games like Dead Rising 3. I know, I know. You'd rather knit than watch me slay zombies, but hear me out on this. Xbox One is actually for both of us. Seriously. It's nice to imagine the Microsoft marketing team pictured a gaming goddess petitioning her afghan-crafting boyfriend for a console upgrade, but come on—we weren't born yesterday. As far as sexist advertising goes, this probably isn't a class-A felony. But it's especially annoying that the letter contains drop-down menus throughout, which allow you to tailor the note to your particular situation. A couple of small tweaks and it becomes "You'd rather eat the skin of 12-day-old pudding than watch me experience the Golden Age of Pirates," which is funnier on every level. It would've been so easy to go with any other default. Upon a flurry of outraged tweets, Microsoft quickly swapped "knit" with "do your taxes early." Maybe next time, the company will know to create something that appeals to gamer guys and gals alike—on the first try.